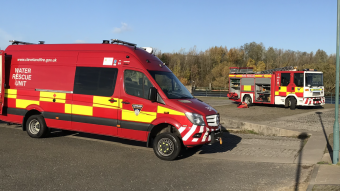 Thornaby Fire Station provides fire and rescue services to the community on a 24/7 basis through four watches of whole-time fire fighters working on the station. Its area is mainly urban in and takes in one of the largest private housing estates in Europe. There is a significant amount of ex-local authority housing and council housing around the town which poses some fire risk. The station covers a town centre development and the campus of Durham University International Study Centre. It is also home to a water rescue team that provides cover to the whole of the Brigade and a large section of the River Tees. The water rescue team are involved in flood planning and provide important water familiarisation training to Cleveland Fire Brigade personnel. Members of the community are able to hire the community room at the station for community activities. Room hire is £4.75 per hour (£5.70 including VAT). To book a room call 01642 536260 or email stne@clevelandfire.gov.uk.